In last two months, treatment given in 7 shootings, 13 car attacks, 58 stabbings and 67 rock throwing attacks. Magen David Adom (MDA) on Wednesday listed its tallies up to this point of how many victims it has treated since the ongoing wave of Arab terror first broke out in mid September. 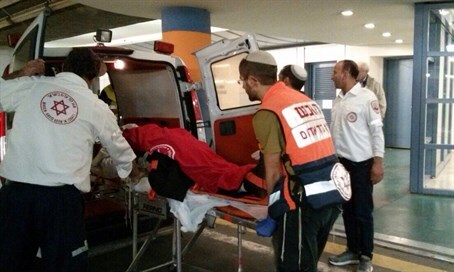 Since the wave of incessant attacks began, MDA has treated and evacuated to hospitals nationwide no less than 225 injured terror victims, who were wounded to varying degrees. Starting with the murder of Alexander Levlovich in mid-September on the Jewish New Year by Arab rock-throwing terrorists in Jerusalem's Armon Hanatziv, the number of those murdered in the attacks stands at 22 victims. In addition 85 people suffering from shock were treated by MDA. The 225 victims treated in total includes the 203 wounded and the 22 murdered victims. MDA medics gave medical treatment in 67 rock throwing attacks, 58 stabbing attacks, 13 car attacks, and seven shootings. The medical organization calls on the Israeli public to be attentive to the instructions of security forces, to stay aware and to contact the 101 MDA emergency hotline in the case of medical emergencies. MDA director-general Eli Bein said, "MDA forces are in high preparedness in the last two months during the wave of terror attacks nationwide." "We are prepared and ready for any occurrence and event in any place, and are working night and day in order to save lives."